Dominique Perrier: Dominique is a member of the band Stone Age, which has several albums available through the usual sources. Click here for a list of all his projects. Roger "Bunny" Rizzitelli: Bunny has recorded with Christophe and is part of the Catalon tour in Europe in 2000 and 2001. He recorded an album of techno trance music called "ABAXIART salut a bientot" but I can find no evidence of its release. Sadly Roger passed away in 2010 and his web site www.bunny77.com is no longer available. Click here for a list of all his projects. 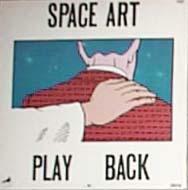 Please send mail if you have additional information on Space Art. 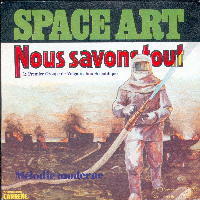 Space Art is Dominique Perrier (keyboards) and Roger "Bunny" Rizzitelli (percussion), two guys from France who were pioneers in the world of electronic music. They recorded three albums before going off to do other projects, like playing with Jean Michel Jarre on "Concerts in China". The production dates are not listed on any of the albums, but I believe they were recorded during the late seventies. The 8-bit mono excerpts here don't even begin to do the music justice. 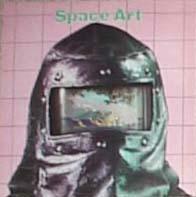 Space Art is unquestionably the greatest electronic music group that ever existed. The albums can be found more easily than you might think in used record stores and on ebay, even though they were only available as French imports. All three albums have been released on CD. 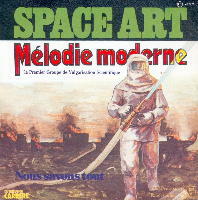 Space Art's first album is truly amazing. Wondrous haunting melodies that flowed from song to song almost seemed to tell a story. The second album is just as good as the first, giving us distinct melodies that did not flow from one to the next like the songs on the first album, but told amazing stories within themselves. 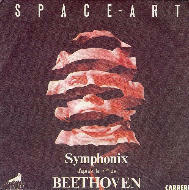 This album contains my favorite Space Art piece, "L'obsession d'Archibald". It is interesting to note that the album was released with two different titles. One was "Trip In The Head Center" and the other was "Trip In The Center Head". It is unknown if this was accidental or on purpose and which one is more rare. The music is identical on both. This was a strange album. 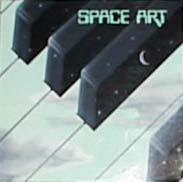 Space Art gave us electronic, jazz, disco, and even TV game show tunes this time. Were they experimenting? Who knows. A couple good tunes managed to surface none the less, but the last half of side 2 degrades into disco/jazz fusion with the cringe-worthy "Welcome To Love". Another unusual detour is found in "Love Machine", which has actual singing, sort of. This rock tune sounds more like a Kraftwerk spoof than Space Art, but is as catchy as it is silly. Parakeet Island is a single from the "Playback" album.